I’ve seen this before, but it makes me smile every time! That’s very good, Jill. ☺ Hope you don’t mind if I indulge myself here with a few words relating to my hobby: etymology. The word ‘tense’ (ultimately from the Latin ‘tempus’) is interesting for etymologists because it was borrowed from Old French into English at a time when it was pronounced /tens/ and usually written that way too: « tens ». (“Ab la dolchor del tens novel …. With the sweetness of springtime…”) But there was a certain “etymologising tendency” at work in French, making words to be spelt like more like their Latin etyma (hence ‘et’ for ‘and’; ‘est’ for ‘is’). The word ‘tens’ fell victim to this tendency and began to be spelt “temps”, whereas it stayed as “tens(e)” in English. It’s interesting that these spelling differences can often obscure the fact that words come from the same origin. 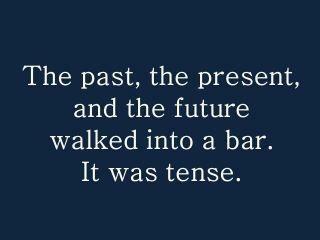 Many students express surprise upon learning that “tense” comes ultimately from “tempus”. (In some languages, they say the equivalent of “the times” for “the tenses” of a verb; e.g. Lithuanian „veiksmažodžio laikai“). Damn. And it stayed tense, too. I’d really like to know how the rest of that story turned out! Funny.